In short, people see less difference between competing offers than ever, but that doesn’t mean that they’re not looking. Search engines and social media sites empower everyone to take charge and figure out their own choices, regardless of your claims and positioning. With consumers, your prospect may be aware of your advertising, or completely tuned out — but they’re making choices on their own terms regardless. If you’re not showing up during the prospect’s self-determined buying journey, you’re not in the game. But if you are showing up via content, you’ve got a chance to tell a truly different story. Your winning difference is the reason people do business with you and not someone else — it sets you apart and makes you the only real choice for the right people. And you reflect that difference with your content marketing. Which begs the question — how do you find your winning difference? Today I’ll give you three different five-minute exercises that will shake loose an idea that works for your content marketing efforts. Brian Clark: In the 1920s, Schlitz beer went from fifth in the market to a tie for first. All because a sharp copywriter named Claude Hopkins highlighted their water purification process in an advertisement. 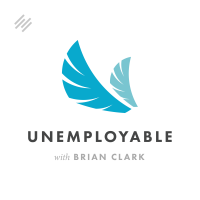 I’m Brian Clark, and this is Unemployable, the show that provides smart strategies and tips for freelancers and entrepreneurs. On the psychological front, take fiberglass insulation, a near perfect example of a manufactured commodity. And yet, Owens Corning became the market leader by focusing their messaging on the fact that their insulation was pink. Fast forward to today, more than 20 years into the commercial web. Any product can be replicated or reverse engineered. Any service can be copied, leaving only execution as a true difference (which comes after the point of decision). If you’re not showing up during the prospect’s self-determined buying journey, you’re not in the game. But if you are showing up via content, you’ve got a chance to tell a truly different story. Even if they don’t see a difference initially, you’ll get the shot at proving you truly are different in a meaningful way. As Sally Hogshead says, different is better than better. The authors of the recent positioning book Play Bigger agree, making the case that you should create a unique category rather than trying to compete within an existing category. Your winning difference is the reason people do business with you and not someone else — it sets you apart and makes you the only real choice for the right people. And you reflect that difference with your content. Which begs the question — how do you find your winning difference? Try each of these five-minute exercises and see if they don’t shake loose an idea that will work for your content marketing efforts. That means your positioning doesn’t have to beat everyone else out. It simply has to appeal to your target audience in a way that’s unique from the others. First up is the Crossroads approach. To create a crossroads difference, take two seemingly unrelated ideas and bring them together. Copyblogger was created from the crossroads approach through the intersection of copywriting and content, plus the idea that you should use content to sell products and services rather than advertising. This made the site a complement to other sources of blogging information, but for a time, it was completely unique. Then the content marketing industry took off. This is how many movies are crafted and pitched. For example, the hit film Speed was famously pitched as “Die Hard on a bus.” Clueless is Jane Austen’s Emma set in 1995 Beverly Hills. So “The Complete Guide to Flower Arrangement for NFL Players” probably won’t find an audience. Next, let’s look at the Metaphor brand difference. Sometimes you can find an overarching metaphor that will snap everything into place. For example, in addition to the crossroads difference at the intersection of travel and personal growth, the title of my email newsletter Further and the tagline “keep going” are both metaphors that represent personal growth itself. Or take one of my favorite metaphor brands, Duct Tape Marketing by John Janstch. John offers something you can find in lots of places — marketing advice for small businesses. No one’s ever going to confuse Duct Tape Marketing with a site called Marketing for Hippies or Mass Control Marketing. With this approach, you can create your own USP just by using a metaphor to define the market, the approach, and the angle. You want the right people to instantly understand what you’re all about — and that’s incredibly powerful when you make it happen. Finally, there’s the Persona-Driven difference. Seth Godin, Martha Stewart, Tony Robbins, Cal Worthington, Erika Napoletano, and Gary Vaynerchuk have all created persona-driven brands. To some degree, this can seem limiting — the business is always tied to you. But each of those people has learned to partner and delegate in order to create companies that go far beyond a single individual. For example, Darren Rowse of Problogger and Digital Photography School is a soft-spoken, helpful gentleman. Chris Brogan will take time to help you no matter what he’s doing. And they’ve both created successful businesses by focusing on what they care most about and how they could help others. At the end of the day, the only reason you need a USP at all is to answer one simple question. Why you? Keep it simple, and keep moving forward. The strongest difference on earth won’t help you if you don’t back it up with all the other actions that create success for a business. That’s it for today. Thanks for listening, and keep going.